Readington Township Police Department is now an approved site for disposal of prescription medication. 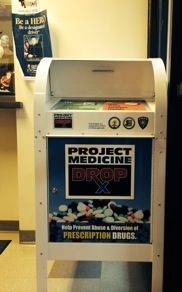 Project Medicine Drop is a program in which, the Division of Consumer Affairs has installed "prescription drug drop box" at The Readington Township Police Department. Members of the public now have the opportunity to dispose of their unused and expired prescription medications safely and securely. The opportunity is available to the public seven days a week, 365 days a year. The Project Medicine Drop boxes are lockable, metal containers, resembling mailboxes and installed at select New Jersey police departments, sheriff's offices, and State Police barracks. The boxes enable consumers to drop off their unused or excess medications safely and securely, with law enforcement agencies authorized to take custody of controlled dangerous substances. Through a partnership with Hunterdon County Prosecutor Anthony P. Kearns III and his office the medication collected at the Readington Township Police Department will be turned over to the Prosecutors Office for destruction. Readington Township Police Department obtained the "drug drop box" with the assistance of Cathy Canterino from Safe Communities Coalition. Cathy coordinated all of the necessary paperwork and submitted the application which was required for approval of the drop box.